This bead-and-sequin "embroidery" technique is used in embellishing some costumes made in Egypt and Turkey. Here are instructions for creating this quick-and-easy trim. It is so easy to do that even someone who is new to sewing can quickly master it! Photo by John Rickman Photography, San Jose, California in 2000. Click on the photo to see the skirt in more detail. This technique was used to outline the bottom edge of both of these skirts. One of the skirts is light green, and the other is dark green. Both were embellished using this edging. The two skirts were purchased in Turkey in 2000, and the pants were made by Shira to wear with it. Photo by John Rickman Photography, San Jose, California in 2001. Click on the photo to see the skirts in more detail. Rocaille Beads or Seed Beeds. Size 8 or 10 (this is the size sold in the plastic packages labelled as rocaille or seed beads). Look for these in craft stores such as Michael's, or the craft departments of fabric stores. They're also sold in stores that specialize in supplies for making beaded jewery. Sequins. The costumes from Egypt and Turkey used to develop these instructions were made using the faceted cup-shaped sequins, 8 mm in diameter. It would also be possible to use the flat style or a different size, but using the cup-style and 8 mm size are recommended for a first project. Look for these in craft stores such as Michael's, or the craft departments of fabric stores. Thin Needle. It needs to fit through those tiny beads! Thread. Any thread will do, but for strength the nylon beading thread called filo is recommended. It can be found in craft stores and beading supply shops. Beeswax.This is optional. Its purpose is to prevent the thread from tangling and knotting. People who don't sew very much may find it helpful to use this because it makes the thread easier to manage. It is sold in the "Notions" department of fabric stores. Either Pins or Tailor's Chalk. If embroidering a design (as opposed to outlining a garment edge), use one of these tools for sketching the designs to be followed. If using this method to decorate the edge of a garment, first make and hem the garment. If using this method to "embroider" designs, use either pins or a piece of tailor's chalk to outline the design. Cut a length of thread no longer than about 24 inches. Thread the needle. If choosing to use beeswax to prevent tangles, run the thread across the edge of the cake to lightly coat it. Knot the end of the thread. Click on the drawing to the right to see it in more detail. Starting at one edge of the garment, poke the needle into the wrong side of the fabric and draw it through to the right side. Thread the underside of the sequin onto the needle, followed by 4 rocaille beads, followed by the top side of a second sequin. Poke the needle through to the wrong side of the fabric about 1/2 inch (or 15 mm) away from where it emerged. Bring the needle back to the right side about 1/4 inch (or 5 mm) away from where it passed through before. Again, thread a sequin, 4 beads, and another sequin, and send it back to the wrong side. Continue in this manner until the edge has been covered or the design has been traced. 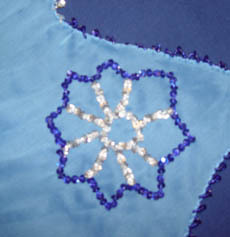 The flowers on the blue skirt shown above were embroidered using this technique. Click on the image to see more detail. The outline of the flower was made with cobalt blue beads and sequins. The inner circle and spokes were made with silver beads and sequins. 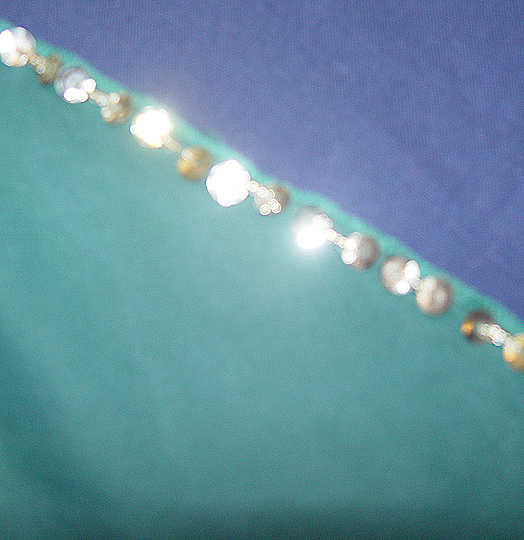 This shows a close-up of the edge of the dark green Turkish skirt in the photo above. The same technique was also used on the light green skirt worn with it in that photo. Both the beads and the sequins are silver on both skirts.